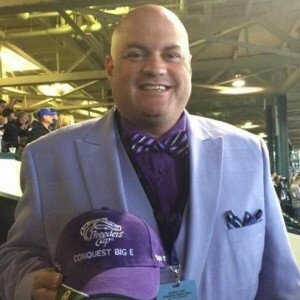 Just a few months ago, Ryan — an avid and deep lover of the Thoroughbred industry — took early retirement from his day job as a firefighter and EMT in Dearborn, MI. and picked up and moved to the Commonwealth of Kentucky and the land of his dreams. Been a long time since I have found and met someone of Ryan’s enthusiasm, dedication, commitment and talent. Although we had met a year or so ago over Twitter, we had never met in person until I knew he had moved to Kentucky and was attending the Keeneland January Sale. I made it my mission to put my hand in his and make the face-to-face. So glad I did. Admire the guy. For what he has done. For what he will do. A $20k claimer sprint kicks off the day and the top-choice won last out but moves up in class #5 FASHION’S TOUCH should have a clear path to grab the lead and not look back on the Keeneland strip that has rewarded front-runners so far this meet. #3 DREAMING DIAMONDS should be right behind the top-choice and is the next best threat. Due to improve second off a long layoff, #3 SANDVILLE looks to tackle an extra panel after flattening out a bit late for trainer Kenny McPeek. Sandville obviously needed the race, and should loom as the top threat to win from just off the early pace. #2 LIGHT OF THE WORLD could run well first time out for unheralded trainer Christopher Davis and adds blinkers, which should help as he looks to be forwardly-placed. #3 PALADAR will make his first start after breaking his maiden at Santa Anita for trainer Richard Baltas. He gets a familiar pilot in Joel Rosario who will look to once again put this son of Street Cry out in front–a winning recipe at Keeneland so far. #1 SARGEANT DRIVE will take a lot of money at the windows for trainer Shug McGaughey and jockey John Velazquez. A bit of a longshot choice here as #1 HANDSOME HONEY is 8-1 on the morning line. A turf affair at one mile, being on the lead on the grass isn’t as important on the main track, so look for this one to drive towards the wire after sitting off the pace. Hopefully jockey Lanerie can do what he does best and save some ground and have the freshest horse late. Another late-runner could be #8 J ZAR and if the two retain odds near their morning lines, a nice paying 8/11 exacta could be a real day maker. Between my top two choices, #5 KOMRAD gets the nod as he’s in form, having raced last month at Oaklawn. A beaten favorite last out, he should get to or near the lead early under Luis Saez. #6 ODIE drops down for the maiden tag and was last seen running at Turfway in January. He’s contested Keeneland before, but not at this low of a level. A threat. A more than decent allowance affair for fillies and mares 3 years old and up, going to look towards the rail and #1 WENEEDTOTALK. Second off the claim by trainer John Ortiz, she gets Castellano up today and that could be the edge she needs. #5 SAGUARO ROW comes off the bench looking to fire off a year-long layoff for trainer Michael Stidham. Joel Rosario gets the nod, but this one may need a race under her belt. Taking another shot with from the eleven hole today with #11 GIZMO in this mile and a sixteenth turf route allowance for three year old fillies. She and jockey Miguel Mena are going to have to get a perfect trip to do it, but the odds will be much more favorable than on the most-likely winner #4 CONNECTIVITY and jockey Irad Ortiz Jr. Both look to score from off the pace. Must go at least four deep in multi-race bets here. Payouts should be decent as long as Connectivity doesn’t win over the second-favorite on the board. Even though she hasn’t run since last trying the Keeneland strip in October of last year, #1 TALK VEUVE TO ME is the class of the race and is a quintessential single in horizontal bets. She gets the job done today so the only question is who hits the wire second. #5 UPSET BREWING could be that place finisher, but she’ll need some pace help in front of her to get the setup she likes best, which is closing late. I don’t think she has the jump to catch Talk Veuve to ME today, though. Trying to get back to .500 (I’m 2-for-5 on the meet so far), I’m not taking much of a leap today, going with what will be a heavy favorite in #9 EXULT. By far the most-likely winner on the card today, don’t expect great win odds, but if we are alive in multis, it will be fun to watch this one break his maiden as we count our money walking out the Keeneland exit gates. Irad Ortiz Jr. aboard for trainer Chad Brown, this son of Noble Mission has finished twice in two career tries and looks to give the Keeneland turf a try here after just missing at Gulfstream nearly two months ago. If he’s in top form, he wins in a cakewalk. If we are due for a big score with the late pick-4, hedge a bit using #5 LAKE NAKARU, #4 EONS and #2 PROUD AS PUNCH on top of each other and the favorite in exacta wheels. Back to .500 sounds about right, and I don’t think we’ll even be using the pick to BAIL OUT today.